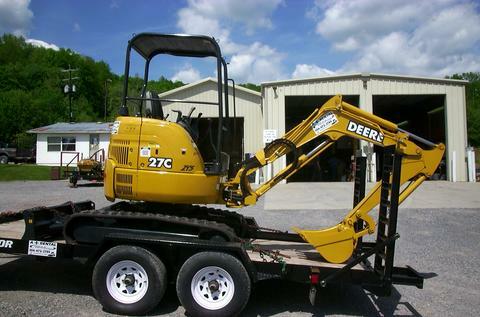 The 60D Compact Excavator is the largest John Deere mini-excavator available. Even though it provides a larger format, the 60D can still be transported easily on a trailer. It can rotate 360 degrees because of a zero tail swing. The operator has a large, comfortable, enclosed workspace that is made up of a large amount of tinted glass to give maximum visibility. Widely-spaced controls provide quick, smooth response comfortably. There is even a port in the cab to power cell phones or other electronics. The 60D engine provides power normally seen in a mid-size excavator. Auto-Idle keeps fuel consumption low and reduces noise to increase productivity and profits. 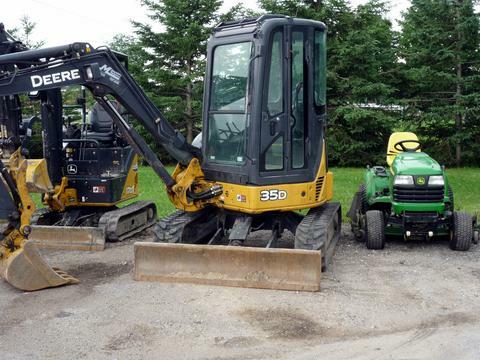 Maintenance on John Deere mini-excavators is made simpler by design and by the quality of the machines. Service is necessary less often due to high-quality, wear-resistant hoses and other well-made components. Access is super easy with a 50 degree tilt open compartment. This allows for work on the swing motor, hydraulic control valve, engine starter motor, and alternator. Consumers can choose between rubber tracks and longer-lasting steel ones. Optional attachments help complete any project. With a manual coupler, switching attachments is quick and easy. Tungsten, carbide-coated surfaces provide durability and easy cleaning.